For many states in the Midwest, a large proportion of land usage is dedicated to agriculture. For example, in Iowa and Indiana, 92 percent and 64 percent of the land is dedicated to crops, respectively. In 2012, approximately 77% of cropland in Iowa and Indiana were treated with various herbicides (USDA). In the past few years, pesticide drift (defined as off-target movement of pesticide during or following application) has become an emerging concern due to the introduction of new agrochemical products and potential for nearby crop or landscape damage, livestock damage, or human exposure. Exposure to pesticides, even via drift, can have an effect on humans and desirable vegetation. Some people experience respiratory distress or skin irritation when exposed, while crops, trees, and flowers can become damaged, made unusable, or die off when exposed to herbicides. For a more in depth definition of pesticide drift, visit the National Pesticide Information Center, here. 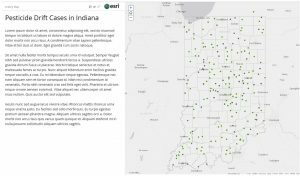 In 2017-18, GPCAH obtained pesticide drift case records from The Pesticide Bureau of the Iowa Department of Agricultural and Land Stewardship (IDALS) and the Indiana State Chemist (ISC). Narrative case files from the years 2010 – 2016 were analyzed. Information from the case files was used to produce interactive and figures for the general public, using ARC GIS. ArcGIS is a software platform used to create, manage, share, and analyze mapping data. To protect the privacy of individuals involved in the pesticide drift cases, we have limited the resolution of the map to municipality level, so that exact locations of the case cannot be identified. These maps were generated from that data to help our farmers, rural citizens, and other researchers learn more about the different causes of pesticide drift events. The data is presented using a story map, which helps to organize the setting and issues in an educational way. We hope that these story maps will be used to provide more education, training, and increase community awareness so that in the long term, drift cases will be reduced. If you have questions about the story maps, or how to used them in an educational setting, please contact us at cph-greatplainscenter@uiowa.edu. 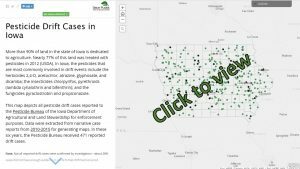 There are many reasons that the pesticide drift case report data in our Story Maps may be incomplete. For the purposes of this project, both confirmed and unconfirmed pesticide drift cases are included. Anyone call report pesticide drift, but not all cases are confirmed. A case is unconfirmed if there is not enough evidence to suggest that drift occurred. In our maps, we include separate information on confirmed and unconfirmed cases. Pesticide drift events are under-reported, because they are often reported for crop insurance or liability reasons. In 2016-2017, GPCAH conducted an informal survey of more than 140 rural residents throughout the Midwest and found that although 74% of rural residents had directly experienced pesticide drift– only about a third reported it to the official state authorities. Some of these individuals stated that they preferred to settle the drift complaint privately, and that they did not want to participate in an official investigation. Nevertheless, only about 40% of individuals knew how to report pesticide drift in their state. Herbicide damage is easily visible (noticeable on surrounding plants), whereas insecticide and fungicide drift may be harder to determine. Want to learn how to report drift in your state? J Ricchio, J Gibbs, R Anthony, University of Iowa Department of Occupational and Environmental Health; A. Kopale University of Iowa Department of Geography. We also thank the Great Plains Center for Agricultural Health Regional Advisory Committee for their thoughtful review of this content.